When a new baby arrives, a first-born boy or older sibling takes on a new role! 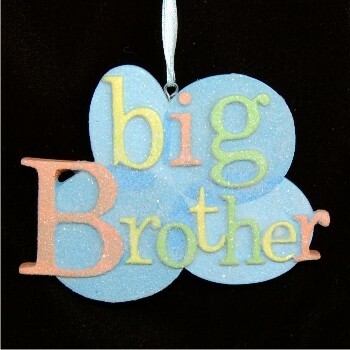 Encourage him in that next step with the my big brother personalized Christmas ornament that features bright, big letters and sparkling glitter in the entire finish. Our lettering artists add your custom details by hand to these family ornaments personalized to make them instant heirlooms when they arrive in our classic velvet drawstring pouch. Help your little man embrace being the big guy with the handsome and cute big brother Christmas ornament personalized with his name and a custom message he'll always cherish.